Rajasthan Electric Industries is a manufacturing unit operating in the market since 1959. We hold the brand name "BRITEX" which serves as a hallmark of our products. We are ISO 9002 & ROHS certified unit delivering high unit goods through technically sound people in a challenging environment. Our products- Copper Wire, PVC Wire, Stranded Copper Wire, Cables, Enamelled Copper Wire/ Strip, Braided Copper Wire, Braided Strips, Tinned Copper Wire, Nickel Copper Wire, Silver Plated Copper Wire, Tinsel Copper Wire, Aluminium Wire etc. We manufacture Electrolytic Copper Wire which is of 99.99% purity free from all types of alloys. Stranded copper wire is much more flexible than solid wire and has a much larger range of motion. 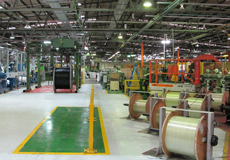 We manufacture bare copper strip that are used in automatic machine to enhance production. PVC copper wires are used extensively in making power transformers, panel boards, electric motors, etc. We offer a wide range of all Aluminium conductors (AAC), which is also known as aluminium stranded conductor. Tinsel wire is a form of electrical wire used when maximum mechanical flexibility is desired. In order to do tin coating on copper wire the material needs to go through a serious of process. The braided copper wire is used as flexible connector for electric appliance, electric stove and storage battery. The braided flexible connectors deliver the maximum amount of electrical power at peak efficiency. Fiber Glass Wire is a composition of glass tape and metal. In Fiber Glass Wire bare copper conductor. We are producing top quality submersible winding wire widely used across various industries. Nickel copper alloy, sometimes called Cupronickel is basically an alloy of copper which contains nickel. We manufacture a wide range of silver plated copper wire that is known for its flexibility , resistance. We manufacture and distribute a qualitative range of Enamelled Copper Wire using 99.99% ETP Grade copper.